Slimvance Thermogenic vs. Hydroxycut SX-7 Black Onyx: two supplements designed with the same goal in mind: melting fat, supporting weight loss, and helping you look lean. Slimvance Thermogenic has a strong scientific backing on its side with one clinical study. Hydroxycut SX-7 Black Onyx is the company’s way of forgetting about its troubled past and starting fresh with safe, legal, and effective fat burning. Are either one of these thermogenic giants worth your money? 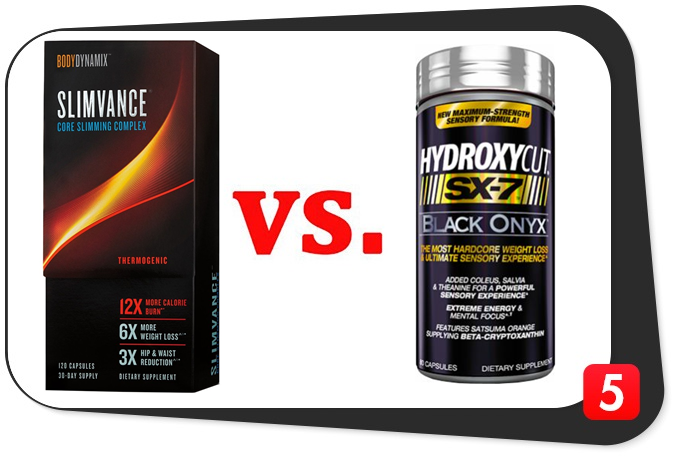 Let’s find out in this Slimvance Thermogenic vs. Hydroxycut SX-7 Black Onyx review. Slimvance Thermogenic has a ton of scientifically-valid and fan-favorite ingredients such as Capsimax™, Garcinia cambogia, and Moringa oleifera leaf extract. Its unique, outside-the-box formula might be exactly what you need to achieve weight loss success. Yeah, Science: One of the few supplement companies to put its product under the microscope, Slimvance Thermogenic has been shown in a clinical setting to reduce bodyweight and supplement weight management. 6X Weight Loss: According to the study from above, subjects lost an average of six times more weight than their placebo counterparts. Calorie Burning: Over 12X: What’s more, researchers discovered that some subjects were burning up to 12 times more calories when supplementing with Slimvance Thermogenic. Twelve times the calorie burning? Not too shabby! Hydroxycut SX-7 Black Onyx is a seven-ingredient thermogenic supplement, ready to take your fat burning to the next level. Great Ingredients: Seven ingredients might not seem like much but when you use the right ones, you don’t need many. Hydroxycut SX-7 Black Onyx seems to have tapped into a great combination of proven fat burners, energy boosters, and nootropics. Double Up (If You Want): You can take the thermogenic compounds of Hydroxycut SX-7 Black Onyx as a single or double dose. This is great for those who want to support their metabolic rate, but don’t want to be overloaded with caffeine or yohimbine. Nothing to Hide: Unlike that patented blend in Slimvance Thermogenic, you’ll find all of the ingredients and their respective dosages in Hydroxycut SX-7 Black Onyx. How are Slimvance Thermogenic and Hydroxycut SX-7 Black Onyx formulas similar? Both of these fancy labelled supplements want the same thing: for you to burn more fat, so it’s safe to assume they’ll be sharing most of the same ingredients, right? Completely wrong. There’s only one: caffeine. You’re probably already well aware that caffeine is a top-notch energy booster, but did you know that it also increases fat burning? Caffeine is an excellent thermogenic, and so it’s not surprisingly that you’ll find it in both of these supplements. For one serving, these two share a good amount of caffeine. Remember that Hydroxycut SX-7 Black Onyx calls for two servings if you can handle them. This puts your caffeine levels up near 300 mg. This is important to know if you’re sensitive to caffeine or if you drinking a lot of caffeine outside of your supplements. How are Slimvance Thermogenic and Hydroxycut SX-7 Black Onyx formulas different? Since they only have one ingredient in common, let’s take a look at what makes these supplements unique in their own ways and against one another. Capsimax®: The trademarked name for red pepper extract, this ingredient has serious scientific credentials, demonstrating its ability to promote fat oxidation and increased weight loss. Moringa oleifera Leaf: As an ingredient which increases the body’s fat-burning response, Moringa oleifera leaf is a powerful way to achieve your weight loss goals. Garcinia cambogia: A long-time fitness favorite, Garcinia cambogia is still one of the safest and most effective ways to promote a healthy bodyweight, when you take it in conjunction with a healthy diet and regular exercise. Green Coffee Bean: Through improving the body’s metabolic response, especially where glucose utilization is concerned, studies have shown green coffee bean can support fat burning and weight loss. Coleus Root: This ingredient has shown to increase fat loss in some studies (but not always total body weight), suggesting lean muscle gains. Yohimbine: A very powerful herbal ingredient, yohimbine is also a tried and scientifically-true thermogenic. Hydroxycut SX-7 Black Onyx made an excellent move here, splitting the dosage between two servings. 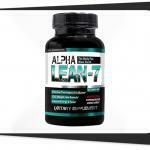 This is an ideal way for a newbie to adjust to yohimbine. 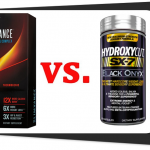 Slimvance Thermogenic vs. Hydroxycut SX-7 Black Onyx: Which is the better formula? As far as formula goes – and only formula – these two are at a draw. Just when you think Slimvance Thermogenic has the better ingredients, Hydroxycut SX-7 Black Onyx surprises you with its own lineup. Is there a clear-cut winner? Yes, more on that below, but when discussing the formulas, both have an incredible lineup that is going to produce results. Price starts to draw a wedge between these two once-equal formulas. Slimvance Thermogenic has a much bigger price point for a fraction of the servings compared to Hydroxycut SX-7 Black Onyx. What’s more, it’s going to be more difficult to get your hands on Slimvance Thermogenic for less than the original price, because it’s only GNC which carries it. If you want to try it, keep your eyes peeled for sales, offers, and promotions. Hydroxycut SX-7 Black Onyx is a great economical option for weight loss because you can take up to two servings per day, but don’t have to. That means if you are seeing results from one capsule per day, you effectively have a supply for more than two months. Even if you double up the dose, you’re still getting a 40-day supply. Hydroxycut SX-7 Black Onyx is available through the usual channels of Amazon and Bodybuilding.com, both of which offer plenty of weekly deals. 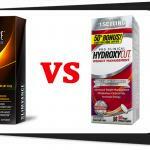 Slimvance Thermogenic vs. Hydroxycut SX-7 Black Onyx: Which is Better? Slimvance Thermogenic is an excellent supplement that has science to back up those claims of weight loss. Its formula is great, with the exception of the guesswork for the patented blend. Its price point to serving ratio is what knocks it down a few notches. If you can get your hands on Slimvance Thermogenic for a huge discount, do so. If not, you’ll stretch your dollar further as you shrink your waist with Hydroxycut SX-7 Black Onyx. Hydroxycut SX-7 Black Onyx has a serious, down-to-business formula. 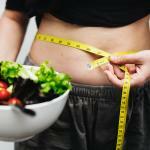 In fact, contemporary weight loss studies have featured all of its ingredients. You control the dosage according to your needs and tolerance (just don’t go above two capsules per day), ensuring you get what you need. A solid choice for weight loss, shredding, and weight management, Hydroxycut SX-7 Black Onyx takes the victory (although just barely).